Colm Tóibín will be speaking at Elmhurst College this evening, on the topic of “The Irish Renaissance.” I am thrilled to say I’ll be in attendance. LG: The term “Irish Renaissance” suggests there was ever a time Irish storytelling and culture was not appropriately respected. Why do you feel there has been an upsurge in “Irishness” and how recent was the shift? CT: The time that interests me most is about 1900. Up to then Irish playwrights – such as Oscar Wilde and George Bernard Shaw – had gone to London and lived there and written for an English audience. In around 1900 the movement began for Irish writers to live in Ireland and write for an Irish audience. This would have political as well as cultural implications. LG: What’s at the heart of this shift? Was there a single catalyst or do you see it as more of a progression? CT: I think the poet W.B. Yeats and his friend Lady Gregory were important, but it was also part of the time, a time when the periphery seemed to be moving towards the centre, when composers were interested in folk music, painters in primitive art and writers in folk tales. LG: On the flip side, for what reasons do you feel the Irish were formerly neglected, or even dismissed, as a culture capable of producing fine art? CT: Name an Irish novel of the nineteenth century. We had no Jane Austen, no Dickens, no Trollope, no George Eliot. Conditions in Ireland were not ripe for the novel; there was too much poverty and dispossession, not enough choices and chances. LG: Ireland is a singular country. It has a distinctive spirit immediately recognizable in its music, language and literature. What about the country lends itself so naturally to the telling of tales? CT: We had no symphonies, no great paintings, but slowly writing began to matter. Paper was cheap; literacy was the only way out of poverty; London was close and London publishers were interested in stories about strange places. The traditional music survived mainly in the west, and partly because of poverty. The language – Irish – did not survive as well because parents became aware that you would need English to go to England or America, as so many did. LG: We’ve just passed St. Patrick’s Day when, here in the United States at least, everyone’s Irish for the day. Is that offensive to you, that Americans (of Irish descent or not) drink green beer and glorify what’s become an Irish stereotype? CT: It’s funny and sweet and should be taken lightly. LG: I’ve asked this question of Frank Delaney, also, by the way, another very literary Irishman. His response was he took it in good humor, that it was a sort of tribute to Ireland in its way. But can it be seen as a negative? CT: No. It does no harm. There is a great connections between Ireland and America and there needs to be some way of honoring it. LG: I compare the feel of Ireland as a main character in literature to that of the American South. In fact, many Irish immigrated to that region, where the culture still echoes. Are you familiar with southern literature and do you see comparisons between the two? CT: Yes, I think so. There is a lovely strangeness about Irish writing, an unpredictability, and a way of handling solitude and dark themes. You also find this in the American South. LG: History has not always been kind to the Irish. Their history has been anything but smooth. From the Famine to the Troubles, the Irish have been beset in so many ways. Yet, Celts are a proud people who stubbornly cling to their homeland. The same may be said of other nationalities, yet it certainly seems the Irish are exceptional in this way. Am I being presumptuous in thinking so or is there really something so standout about the Irish? CT: I wonder about this. I think small countries in Europe, such as Croatia and Catalonia, the Basque Country and Estonia also have it. LG: ‘The Testament of Mary’ is not the only novel written by an Irishman to have been recently nominated for the Booker Prize. Sebastian Barry’s ‘On Canaan’s Side’ was, as well. Is this a part of the “Irish Renaissance,” what you find significant of late? CT: Three Irish writers have won the Booker Prize, and a good number of us have been nominated for the Prize– I have been nominated three times. And there are a number of good young writers publishing first novels now. There is a lot of energy in the literary culture. I wish I could say the same about the politics. LG: From what I gather, you no longer live in Ireland, but rather here in the U.S. Many Irish find a certain kinship with America, a welcome as it were. Do you feel as moved to create here as in your native Ireland? Is what you have accomplished here rooted in Ireland or inspired, at least partially so, by America? CT: I teach here one semester and then I go home. I like the openness of America. I like American manners, and the students I teach at Columbia are serious and hard-working and talented. LG: Finally, a bit of lighter tone from what I’ve asked earlier. Were you a bookish child, as is the case with so many writers? Was your home supportive of reading and traditional storytelling or did you pursue this on your own? CT: There was no traditional story-telling. There was a lot of silence. But there were books and books mattered. And yes, I was, from about the age of twelve, a very bookish kid. Great interview and great questions. 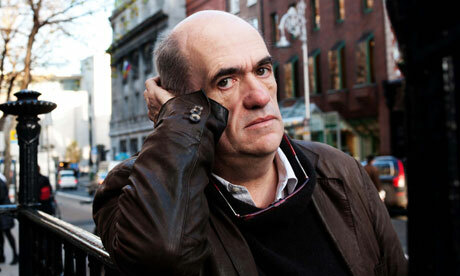 What a great coup to interview Colm Tóibín. I loved his book, The Testament of Mary. I hope you enjoyed his talk. Thanks! I had to push a bit to get this interview but he came through for me. I’m parked at the college where he’s speaking and now have to figure out which building it’s in. I don’t get along well with college campuses… Will post in his talk soon.